Address: Avenida del Saladar, 6, Morro del Jable (Fuerteventura), Islas Canarias. This Robinson Club lies in southern Fuerteventura, 2 km from Morro de Jable. 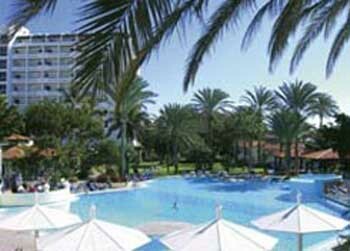 It features direct access to Jandia Beach, a large outdoor pool, tennis courts and a spa and fitness centre. The spacious rooms of the Robinson Club Jandia Playa - Adults only come with satellite TV, a fridge and a safe. Most have a private balcony and air conditioning. Guests can relax in the 60,000 m² gardens. The WellFit spa and fitness centre includes a hot tub, steam room, sauna and massage service. Windsurfing, sailing, diving, beach volleyball and painting are just some activities on offer. Varied buffet meals are served for breakfast, lunch and dinner. Wine, beer and soft drinks are included. There is a nightly entertainment programme. The town has ferry connections to Gran Canaria and Tenerife. Free parking is available nearby. Wonderful&New Flat in Morro Jable, Jandia!